As I've said many times over, I do not know whether Brett Kavanaugh's accuser is acting in good or bad faith, nor does virtually anyone else. She could be lying. He could be lying. Or they could both be telling what they firmly believe to be the truth, based on an array of faulty, hazy or false memories. What matters now is how we assess the available evidence, of which there is precious little. Earlier, I laid out my own attempt at erecting some reasonable, if imperfect, metrics for doing just that. Setting aside the veracity of Prof. Ford's unsubstantiated claim, I very much harbor increasing suspicions about the motives and behavior of Senate Democrats. Recall that Sen. Dianne Feinstein -- who just yesterday admitted that she doesn't know if Ford is being entirely truthful -- has had Ford's allegations in her possession since July, well before Kavanaugh's confirmation hearings were even scheduled. Over the summer, she reportedly told her colleagues that the accusations were too distant to merit serious scrutiny. Then, after the hearings concluded, someone (certainly a Democrat) leaked the existence of the accuser's letter, apparently violating Ford's explicit wish to remain anonymous. This development inevitably led to the emergence of Ford's claims, conveniently timed to detonate during the very short window between the hearings and the Senate Judiciary Committee vote. 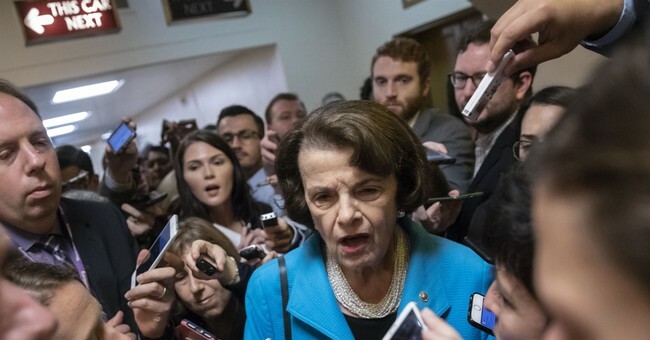 Republicans and Democrats alike seem to be frustrated with Feinstein's handling of the entire matter. Ford’s legal team is engaging in bad-faith posturing on those points, but they added a shabby accusation against Grassley as well. The letter accused Grassley of planning to seat Ford “at the same table” as Kavanaugh, but Grassley responded yesterday by saying that no one had planned the two to appear together. They would have appeared at “the same table,” but at two different times. (1) The FBI has already declined to launch an investigation into this 36-year-old claim, for which there is no alleged crime scene or date. Ford says she doesn't know where the house was, and can't even narrow down the encounter to any specific month of 1982. This not only renders any criminal investigation hopeless, it also forecloses any possibility for Kavanaugh (or any of the other three boys alleged to have attended the party) to potentially provide an accusation-destroying alibi. The Bureau, which has already performed six background checks on Kavanaugh, inserted the allegation into Kavanaugh's background file. There's nothing more to be done. Insisting on their resumed involvement, with no jurisdiction, or even a clear or realistic goal, smells like yet another delay tactic. I'll return to this theme later. If we are to believe Ford's memory -- which is the whole basis of this entire case -- anyone now belatedly attesting to contemporaneous knowledge of the alleged incident must be viewed with significant skepticism. They're contradicting her. Or she's misremembering a crucial detail, which presents a separate problem. (UPDATE: The aforementioned woman now says she has no firsthand knowledge of the situation and is refusing to comment further). Hawaii Sen. Mazie Hirono (D.) said Democrats could keep the open seat on the Supreme Court vacant until after the 2020 election if Brett Kavanaugh's nomination collapses and Democrats regain control of the Senate in November..."I think we’ve had those kinds of vacancies before, and we certainly had over a one-year vacancy with Merrick Garland," Hirono told Politico Magazine. "So the world does not come to an end because we don’t fill all of the nominees."